She lost three other babies and she can't believe she gets to keep this one. 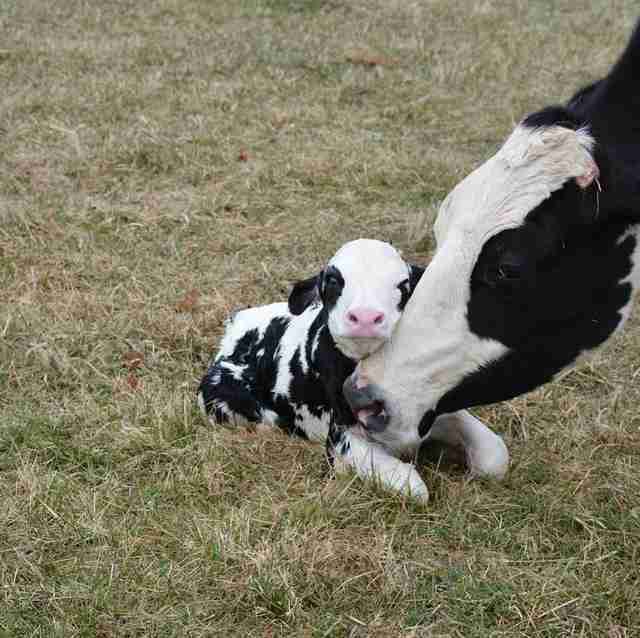 A baby cow is taking his first steps today — and his mom is getting to stand by him. 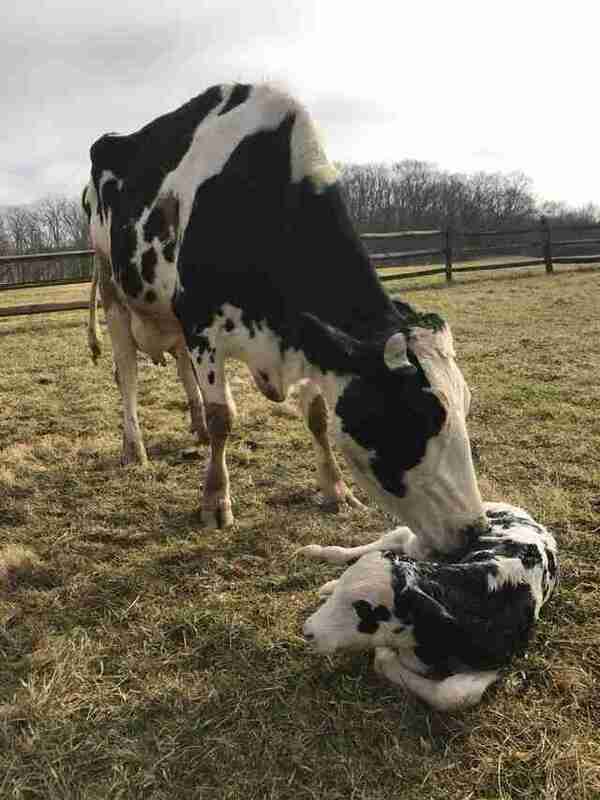 It's the first time Maisie, a cow saved from a dairy farm, has ever been able to be by one of her babies for this long. 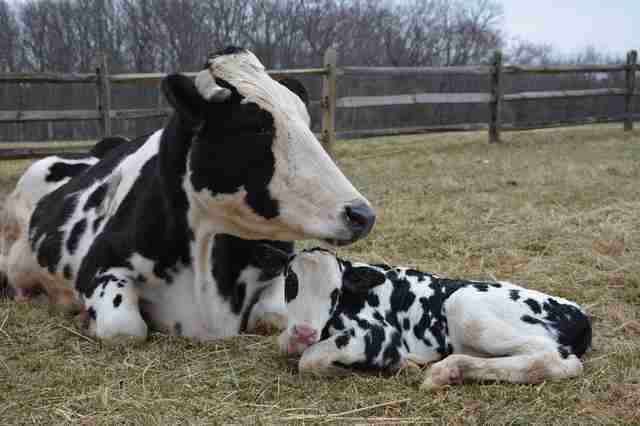 She had three calves before on the farm, but they were all taken away from her soon after she gave birth and sold. Earlier this year, though, Maisie had a stroke of luck when the farmer, who became too elderly and sick to keep up his Pennsylvania farm, decided to close it down. He sold all the other cows at auction, but he decided not to sell Maisie, but to give her a better life. "Maisie was special to this farmer, so he agreed to let her live and go to a sanctuary," Terry Cummings, founder of Poplar Spring Animal Sanctuary in Poolesville, Maryland, wrote earlier this year when Maisie first came to live at the sanctuary. "When she was young she would jump the fence into the farmer’s yard and hang out with his dogs. She would run around and play with the dogs and she loved people and would follow him around." Grace Froelich, who works with Animal Rescue, Inc, feeds a colony of cats near the dairy farm, and knew the farmer, so she helped him arrange the new chapter in Maisie's life. 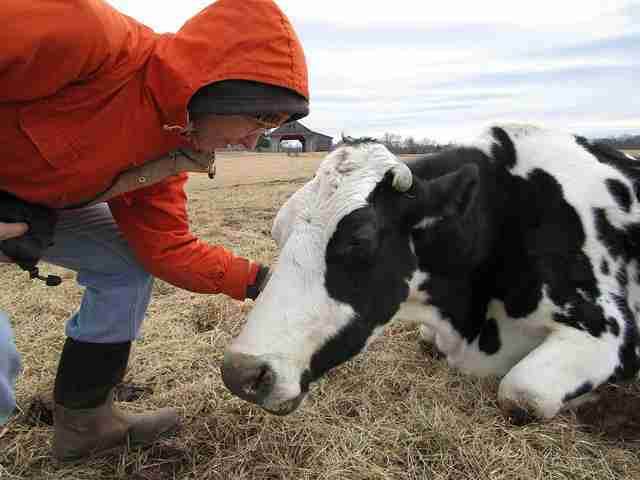 Froelich then drove Maisie from Pennsylvania to Maryland, where she was welcomed with open arms — all thanks to the farmer's attachment to the cow. 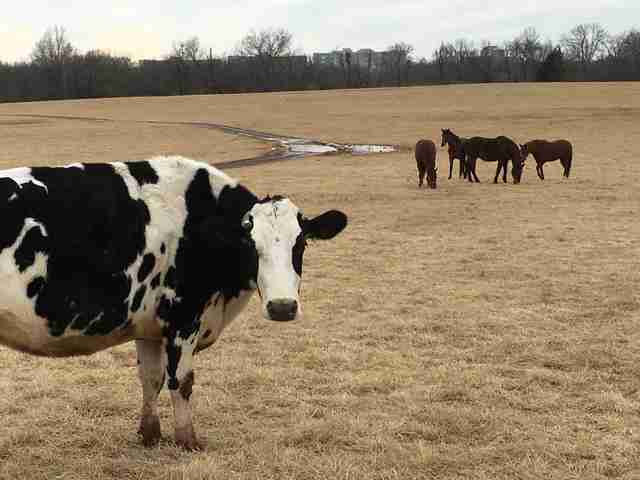 "With this one cow he was able to see how cows can be friendly and how much personality they have, if just given the opportunity to show it," Cummings wrote. "The farmer even shed a few tears as she was being led onto the trailer." Little did anyone know, though, that they were saving two lives that day. After almost two months living at Poplar Spring, people began to notice that Maisie had grown a bit bigger around the middle — she was pregnant. Being pregnant is probably something Maisie, like all dairy calves, is used to — going through the constant cycle of impregnation, pregnancy and birth is how they are able to continue to produce milk. But this time, things would be different for Maisie. Her calf wouldn't be taken from her the way the others had been. Earlier this week, Maisie got ready to give birth — and everyone at the sanctuary got so excited to welcome Maisie's baby. As soon as her calf was born and took his first few steps, people felt nothing but joy; for the first time Maisie will be able to nurse her baby as long as she wants. 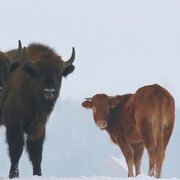 Then they'll live their whole lives together at the sanctuary. "It's unbelievable how lucky Maisie and her baby are," Cummings told The Dodo. "They are so happy and healthy!" And people who were following Maisie's story were overjoyed to hear her baby was born. "Now, for the first time, Maisie’s baby will have a name and a future, and they will be able to live together happily for the rest of their lives," Cummings announced on Facebook. The people at the sanctuary will be voting on a name for Maisie's baby soon. "The mamas often hide their babies as they are afraid the calf will be taken," one commenter pointed out, about cows rescued from dairy farms. "It is awesome she let you be there." Maisie must know just how lucky she is. You can give Maisie and her new baby a gift by donating to Poplar Spring.